Two Devon colleges have spent £330,000 rebranding their image after a merger in 2008. The new name for North Devon College and East Devon College will be Petroc, it was announced on Wednesday. The renaming, which cost £25,000, was part of the rebranding, which includes new signs and prospectuses. North Devon College said that with 20,000 students across Devon, Cornwall and Somerset, it was an "opportunity to redefine ourselves". Principal David Dodd said: "It became very clear that as two colleges coming together as equals, we could not stay under the same name. "A lot of people know something about us, but they don't understand the whole range of what we do." 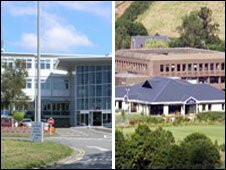 He added: "As a merged college we are no longer just North Devon College in Barnstaple. "It is very much about understanding who we are as one college and articulating that." The merged college, which has premises from Bude in north Cornwall to Exmouth, employed branding firm Interbrand to carry out the exercise. Mr Dodd said the name Petroc emerged after about 200 people generated 400 possible names. The aim was to come up with a name that that had "perceptions of Devon, of the colleges and its people". Mr Dodd said: ""Though ancient in origin, Petroc has the look and sound of a modern word. It could be coined today." Funds for the rebranding came from the Learning and Skills Council. The name Petroc has associations with Cornwall, but the college said it had stronger links with Devon. "Cornwall's main patron saint is St Piran, whose flag is recognised as the Cornish national symbol. "St Petroc was born in Wales but primarily ministered to the people of sixth century Dumnonia (now Devon, Cornwall and parts of Somerset and Dorset). "He is one of Cornwall's patron saints but there are 17 churches dedicated to him in Devon, while there are just five in Cornwall."